Geneo+ takes its inspiration from natural hot springs, known for inducing skin oxygenation. By stimulating this effect Geneo+ triggers a response that sends oxygen to the area. At the same time Geneo+ exfoliates the skin and creates an optimal environment for infusion of essential nutrients both during and after treatment. EXFOLIATION of the outer layers of skin. Remove dead skin cells and prepares the skin to receive active nutrients. INFUSION of unique revitalising formulas and oxygenation from within. Through the exclusive Capsugen, Geneo+ cleanses the skin whilst infusing nutrient-rich formulas ensuring maximum oxygen absorption. TIGHTENING and contouring. Radio-frequency is used to stimulate fibroblast activity and to produce collagen formulation, immediately tightening collagen fibres for tissue retraction in the skin. Tightens and firms, hydrates and nourishes whilst revitalising dull skin and smoothing the appearance of fine lines and wrinkles. Brightens and nourishes the skin, minimises the appearance of uneven skin tone, diminishes the appearance of pigmentation and reduces the appearance of sun damage. 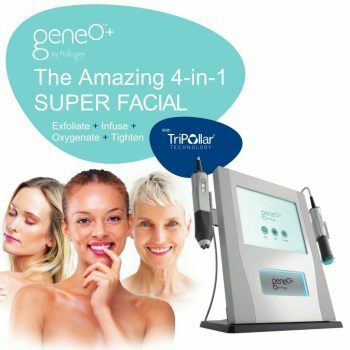 What is the GeneO+ Facial Treatment ? The treatment begins with a microdermabrasion treatment. The combination of the NeoRevive or NeoBright gel and the Capsugen gently buffs the skin creating oxygen bubbles which are infused into the skin tissue and oxygenates the blood stimulating cell renewal. After the microdermabrasion phase of the treatment, the gel is removed, reapplied and massaged into the skin using the electrical hand piece to ensure that the product is infused deeper into the skin than a manual treatment could do. The treatment uses consumables that are hygienically sealed and used for your treatment only. Your skin will feel amazing immediately after treatment looking brighter and smoother. When applying moisturiser and makeup after the treatment you will find that the products glide onto your skin smoothly and that you get the more benefit out of your home care skincare products. A course of 6 weekly treatments is highly recommended if you are looking to deal with a particular skin concern such as fine lines and wrinkles, pigmentation or dull,lack-lustre skin. Monthly treatments are recommended if you want to keep your skin looking smooth and fresh looking. A one off treatment is great before a special occasion to boost your skin. This facial is known as the Super Facial and includes skin tightening Radio Frequency. If you are concerned about premature aging, fine lines and wrinkles then this is the treatment for you. This fabulous skin rejuvenation treatment stimulates collagen and elastin in the skin whilst plumping out fine lines and wrinkles. It is most effective immediately after the GeneO+ Facial but can also be a stand-alone treatment. A course of 6 weekly treatments will give you the best possible results but you can expect immediately visible results after just 1 treatment. What is Radio Frequency (RF) ? The Radio Frequency has been used safely and effectively in medical settings for over 75 years and safely heats the skin tissue deep from within whilst protecting the epidermis (visible layer of skin). GeneO+ uses TriPollar Technology which is clinically proven. Collagen keeps the skin plump and younger looking and RF also stimulates the cells in the skin responsible for collagen production. This provides long lasting visible results and immediate tightening of the skin. The treatment is very comfortable and relaxing and different from older versions of Radio Frequency – the Pollogen’s TriPollar handpiece detects when the deeper part of the skin is heated to the correct temperature without any risk of causing trauma to the skin. It is suitable for all skin types and colours. A course is highly recommended for optimum results and can last up to 2 years with occasional top up treatments. Immediate results are visible after just 1 treatment making this fantastic for clients looking for an advanced facial for a special occasion or wedding. To add décolletage (treated at the same time as any of the facials above) there will be an additional charge of £20 per treatment. GeneO+ Facials are perfect for Brides, Mothers of the Bride or Mother of the Groom as well as for any other special occasions when you want to be looking your best. Is there any down time or recovery time for the treatment? There is no down time with GeneO+ treatments, however we do recommend that you apply a good SPF 30 or above for 24 hours after treatment and that you avoid the use of sunbeds, bathing in hot water and hot activities. Is GeneO+ suitable for all Skin Types? Yes GeneO+ is suitable for all skin types and colours. Are there any contraindications to having the treatment? Yes, as with all electrical facials there are a small number of people who (for medical reasons) are unable to have certain elements of the treatment examples are epilepsy, heart pacemaker, metal implants. A full consultation will be given to discuss your specific history.